This view from a camera mounted to the second stage of the private spaceflight company SpaceX's Falcon 9 rocket shows the blue Earth fall behind as the rocket launches an unmanned Dragon space capsule on Dec. 8, 2010. Almost immediately after commercial rocket company SpaceXlaunched its Dragon spaceship for the first time, the Twitterverse was abuzz thismorning (Dec. 8) with the news. The hashtag #SpaceX was trending, and congratulations pouredin from all corners. "Dragon in the sky! Congratulations to the SpaceX teamfor a successful launch," tweeted the officials behind NASA's Keplerplanet-hunting mission, while NASA's deputy administrator Lori Garver had thisto say: "Congrats to SpaceX on a picture perfect launch!" Dragon liftedoff atop SpaceX's Falcon 9 rocket at 10:43 a.m. EST (1543 GMT) from the Cape Canaveral AirForce Station's Launch Complex 40 in Florida. "Congratulationsto SpaceX on their successful Falcon 9 launch this morning!" tweeted WayneHale, a former NASAshuttle program manager. SpaceXwas founded by millionaire ElonMusk, who also cofoundedthe online payment system Paypal. Today's launch apparently made his motherproud. "CongratulationsSpaceX & my son Elon! Waiting for Dragon to re-enter atmosphere. Then I'llneed to workout," tweeted Maye Musk. X Prize founder Peter Diamandis tweeted, "Congrats Elon& SpaceX! 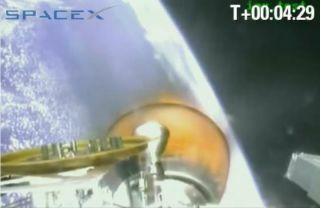 Falcon9/Dragon launch going perfect." Theflight was Falcon9's second launch, coming six months after a successful inauguraltest flight. "Way to Go SpaceX-- Falcon 9 is two for two! NowDragon's turn to debut! Already a good day for Commercial Space!" tweetedplanetary scientist Alan Stern, a former associate administrator of NASA'sScience Mission Directorate. Another planetary scientist, Caltech's Mike Brown (famousfor discovering the dwarf planet Eris), chimed in after viewing the broadcastof the camera feed from the rocket: "Whoa. The view FROM Falcon 9 isFABULOUS." Thelaunch was also the first under NASA's COTS program (CommercialOrbital Transportation Services), which funds commercial companies to develop spacecraftcapable of carrying cargo and people to the International Space Station. NASAastronaut Jose Hernandez tweeted, "NASA's Commercial Orbital Transp.Services Program's SpaceX Falcon 9 launch vehicle successfully lifted off fromCape Canaveral today!" Accolades also came from less-expected quarters, such as actorSeth Green, who wrote, "Super exciting! RT @NASA SpaceX Falcon 9 launch atT-8 and counting." Actor and film director Jon Favreau, who helmed "IronMan" and its sequel, wrote, "SpaceX(where we shot Hammer Industriesin IM2) launches rocket. Congrats Elon!" (Musk had a cameo in Iron Man 2). SpaceX is chronicling the mission on Twitter as @SpaceXerand @SpaceXmissions.